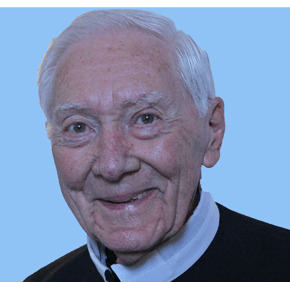 A Redemptorist priest who completed pioneering work helping elderly priests transition from active ministry died April 20 at 91. Redemptorist Father Edwin G. Foley, whose pastoral ministry in the Archdiocese of Baltimore included work at Our Lady of Fatima in Baltimore, St. Mary in Annapolis and Sacred Heart of Jesus in Highlandtown, was remembered as a gentle scholar who had an ability to relate to people. Father Foley had a master’s degree in sociology from The Catholic University of America in Washington, D.C. In his later years, Father Foley used his skills in that field to craft retreats for aging priests. In a 2001 interview with the Catholic Review, Father Foley likened retirement to a beginning rather than an end. Working for his religious community, Father Foley joined Redemptorist Father Syl Feeley in studying and crafting policies on aging and ministry. He was asked to serve on a newly formed Secretariat for Senior Confreres less than a month before his 91st birthday. Born in Brooklyn, New York, Father Foley knew from a young age that he wanted to become a priest. Father Gildea noted that his friend was inspired by the religious sisters who told him stories of great Redemptorist missionaries. “He was so impressed by those stories that he wanted to go to these exotic locations,” Father Gildea said. Father Foley professed his vows as a Redemptorist in 1942 and was ordained to the priesthood in 1947. He served for more than 12 years in Puerto Rico and in the Dominican Republic as a personal assistant to Bishop Thomas Reilly, a fellow Redemptorist. “One of his great contributions was his leadership in helping folks adjust to the Second Vatican Council,” Father Gildea said. Father Foley served as associate pastor at Our Lady of Fatima from 1967-69; St. Mary, 1989-90 and Sacred Heart of Jesus from 1990-2001, where he also served as chaplain to the now-closed Holy Redeemer Chapel. He lived in retirement at Our Lady of Fatima before recently moving into Stella Maris, Timonium. He had other assignments in Florida, New York and Ohio. A funeral Mass will be offered at 11 a.m. on April 24 at Our Lady of Fatima.